Mexican pop star THALIA is to relaunch her career on husband TOMMY MOTTOLA's Casablanca Records label with a ROBBIE WILLIAMS duet. The singer has dropped EMI Music, her label for the past 10 years, and plans to release a new English-language album. Thalia recorded 12 albums and sold nearly 20 million copies as an artist at EMI. After 12 years with EMI Records, it is rumored that Thalia is no longer with them. The contract with her label was not renewed as she is moving on to be on hubby Tommy Mottola’s label, Casablanca Records. Thalia’s last album was a major disappointment, and she blames the lack of marketing for it due to the fact that she was just returning from having a baby and had that problem with the tick. Another juicy tidbit floating around is that the new single off her next album will be a duet with Robbie Williams. from POPDIRT - year 2003. 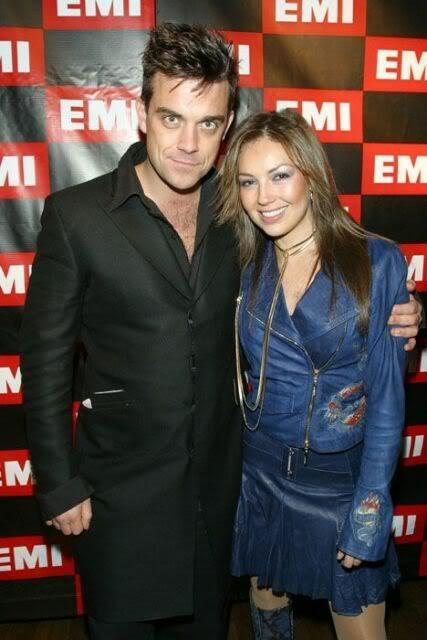 Mexican singer Thalia was seen with Robbie Williams engaging in what seems to be a spirited conversation about music during the Virgin Records after-Grammy party. Thalia also rubbed elbows with old friend Kelly Osbourne. Thalia is a good singer...very known in my country! She's made a few tv series! I don't know if they're really going to do the duet! I'll believe when I see it!